(CNN) -- John Kucera is the new men's world downhill champion after claiming an upset victory in changeable weather conditions at Val D'Isere on Saturday. Kucera took advantage of changeable weather conditions to become the downhill world champion. Taking advantage of perfect early conditions, the Canadian was second out and clocked a time of two minutes, 07.01 seconds to continue a topsy-turvy downhill season which has seen five different winners in the six World Cup races so far. 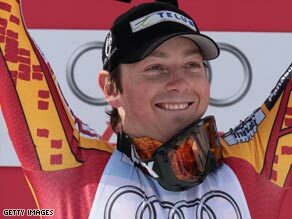 The 24-year-old Kucera had only won one World Cup race prior to Saturday's victory, a Super-G at Lake Louise in 2007, but managed to fend off all the pre-race favorites who were hampered by clouds and fog which engulfed the later starters. Swiss Super-G gold medallist Didier Cuche, who started 16th, claimed silver just 0.04 seconds behind, while his compatriot Carlo Janka was a further 0.13 seconds adrift in third position. Michael Walchhofer, leader in the World Cup downhill standings, was allowed a second descent after his first was ruled to have taken place in "irregular conditions". However, the Austrian could only manage ninth place -- 1:43 seconds behind Kucera. American Bode Miller, a critic of the Bellevarde piste in recent weeks, came home in eighth place, 1:37 seconds off the pace. Switzerland's Didier Defago, who won the downhill classics at Wengen and Kitzbuehel last month, was in a good position to push for at least a podium spot when he suffered a dramatic fall.